Sometimes, it’s not always easy to come up with post ideas. It’s called “writer’s block” and we all deal with it. That’s why it’s smart to stock-pile on post ideas and keep drafts ready to go. This way you don’t skip a beat and your readers will always land on something fresh. 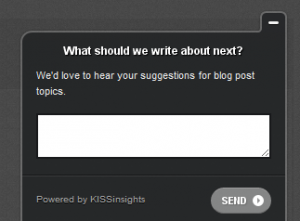 KISSinsights offers a pretty neat and simple way to poll your site visitors. They have a Free plan and a paid plan and it’s pretty easy to install on your website once you’ve selected your survey. What would you like us to write about next? The idea is to collect insights from your site visitors and find ways to improve your website to make it easier to navigate. Or in this case, to get some suggestions for upcoming blog posts! How might you use KISSinsights?